I love reading books about physical recovery. It inspires me to keep healthy and fit in spite of challenges and continue to move forward even when I have set backs. I also learn new medical information, resources and coping methods. The Long Run is a great read about an elite athlete and firefighter who was involved in a bike accident (he was hit by a bus). Even though he wasn’t expected to live, he miraculously began the road to recovery. Matt shares both his struggles and milestones in an honest and compelling way. I was captured by his story, moved by his pain and encouraged by the people who supported him. I was also amazed by the body’s ability to not only heal itself, but how Matt Long was able to still push his body to the limit. Though the struggles didn’t end, he found a way that helped him continue to live in spite of his new circumstances. Though I personally haven’t seen the healing that I would hope for, I believe that growth is essential to my well-being. I must strive to move as much as I can each day to help my body heal. Even if my day or my week makes it difficult to exercise or accomplish what I wish, I must avoid dwelling in self-pity for too long. In general I love being active when my body is feeling well. I enjoy a walk, a run, a hike, playing soccer with the kids, lifting weights, doing yoga and racquetball. What can be harder for me is finding the time and energy to exercise when so many things in life seem to jump in the way or I have too much pain. The most consistent way that I am able to exercise is when I involve my friends and family in my activities. This keeps me from being isolated and becoming depressed. When involved in personal exercise like running, it is generally best done in the morning. Rarely do I come away feeling worse than I did before exercising. At times the pain can increase or my symptoms will intensify, but overall I will feel better in the long run. It is always helpful to remember that others have been here too, and I can press on. Thanks Matt for sharing your story. I can feel the pain intensify as I am standing in place, listening to my husband give soccer instructions to 12 girls. As a co-coach I need to pay attention so I can implement what he is teaching. I move around back and forth, as this reduces the pain that is circulating through my body. I ignore my feelings of paranoia, concerned how I might look to the outsiders who don’t know of my illness. I can feel the warmth of my body, as my fever begins to spike, like a premature heat flash that randomly appears. As the instructions are finished, I recruit half of the girls onto the opposite player field. I try to remember what I am supposed to do, as my fatigue and mild ADD seems to muffle even the best of teachings. It is similar to living with a constant flu, with the aches, mild fever, and tiredness. I attempt to implement what I can understand of the drill by watching my husband from across the field, and making up the rest. I am less aware of the pain, as I am running around chasing after flying soccer balls. My fever seems to level off, though I find it difficult to breathe when I am running too fast. 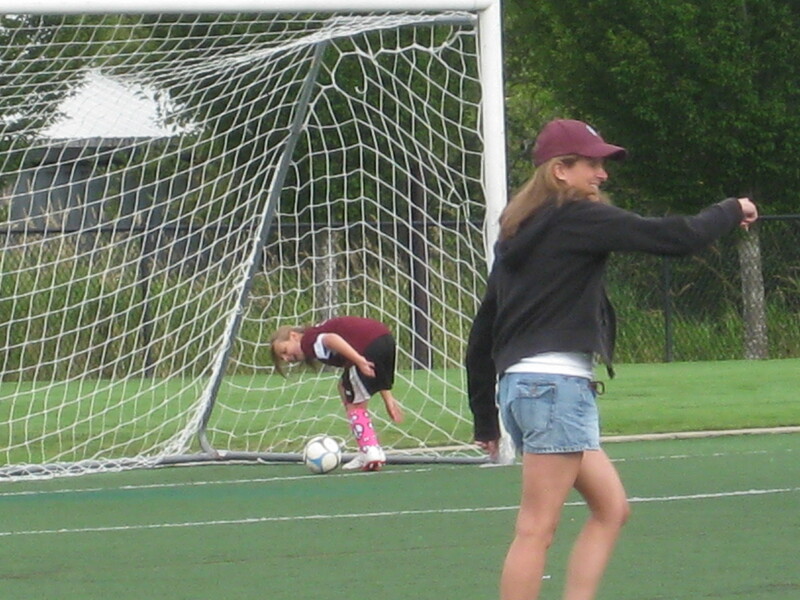 I slow down my pace and send Sarah off to collect the ball that flew past the goalie net. I am grateful for the sun that is shining today, as the cold weather makes my fingers and toes go numb, which makes kicking a soccer ball painful. I look up, and see Kathy make a goal. The sounds of laughter and cheers from her team mates, brings me into the moment. I smile and tell her “great kick at the side of the goal”. Having chronic pain can effect greatly what I do, even on the soccer field. When I become more in tuned with my own pain, I also take in more of what is around me. My meditative state allows me to go deeper into the pleasures around me, as well as accept the pain that often comes with it. These moments hanging with my soccer girls are treasures I will keep in my heart, the blessings that I am aware of, that bring life to today.